Double-Winged Hawk Girl is a NPC in Demon's Souls. If a desired item is dropped, the crow will acknowledge it happily. If it doesn't like it, just pick it back up. If the crow likes the item, use the [Start] menu to load the current game, or return to the Nexus and come back later. The traded item will appear on the right side of the tree, ready to be picked up. If an undesired item is dropped, it will be lost if the player loads the game or leaves the World. Don't forget though, that loading the game will respawn the Crystal Lizards and reset the floor traps in the level. You cannot drop multiple items to be exchanged. If you drop say, a Soul Remain and an Augite of Guidance, only one will be exchanged and the other item dropped will be lost. In Shrine of Storms, at the highest point in the level, there is a tree with a large nest and a talking crow (also known as 'Double winged hawk girl') asking for "Sparkly, Twinkly" stuff. 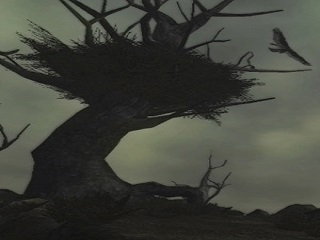 From the tower which leads to the lone skeleton archer and the Compound Long Bow, there is an exit which leads out to the cliff top towards the crow's tree. Give sparkly, me! Give twinkly, me! Me, caw, you, trade, trade! No sparkly! Caw. That not twinkly! Give sparkly, me! Caw. Give twinkly, me! Caw, caw, you, scary, caw. Please, please. Give, caw, give!